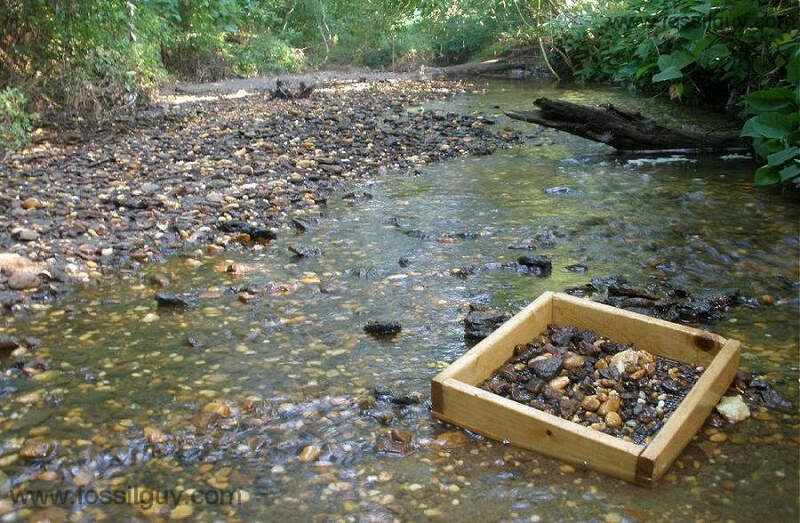 A quiet morning while fossil hunting for Shark teeth in Ramanessin brook, New Jersey. 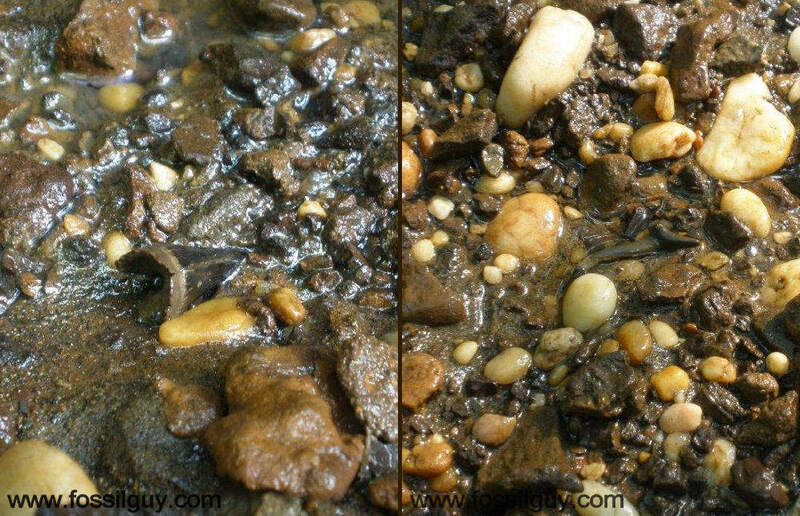 Left Image: A fossil Mosasaur tooth lying on a gravel bank in Big Brook, New Jersey. 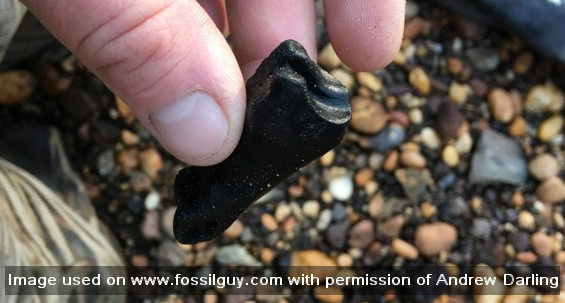 Right Image: A fossil Goblin shark tooth lying on a gravel bank along Big Brook. While Fossil Hunting, Climbing over fallen trees is a common occurance in the brooks. Due to the everlasting popularity of dinosaurs the Triassic, Jurassic, and Cretaceous time periods are well known to the public. When people think of the Era of the Dinosaurs, they may think of Paleontologists digging out west in the badlands of North America where the famous 19th century "Bone Wars" occurred. However, not many people know that America's East Coast has its share of Dinosaurs! States all along the East Coast, from Main to Alabama all contain fossil deposits from the age of dinosaurs. In fact, in 1838 North America's very first nearly complete dinosaur was discovered in New Jersey. The specimen, a Hadrosaurus foulkii, was later studied in 1858. The first Mosasaur fossil described from North America was also discovered here! Today amateurs fossil hunters can still go to New Jersey and find Dinosaur aged fossils. Anyone with an interest in fossils can enjoy a trip down to New Jersey to dig some up. 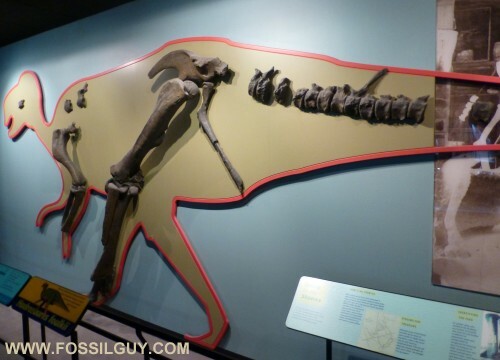 One of the better known areas is in Monmouth County where Cretaceous age fossils can be found. Throughout the county, Big Brook and surrounding brooks cut through the ground, digging though the layers of earth. These brooks erode through recent layers, cut into the Pleistocene, and finally carve away at ancient fossil bearing Cretaceous deposits. 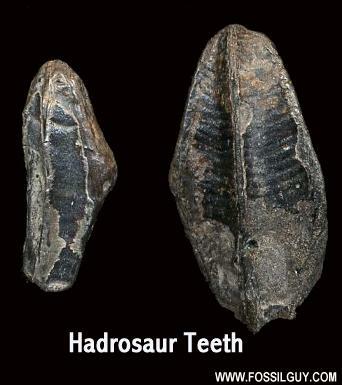 River Worn Hadrosaur Dinosaur Teeth - Although all dinosaur material is scarce, hadrosaur teeth tend to be the most common type of Dinosaur fossil found. This is a Dryptosaurus dinosaur toe bone found in one of the brooks in New Jersey by Andrew Darling. This is a rare find. It has been donated to the Rowan University. If dinosaur bone is found, I recommend donating it to the NJ State Museum or to Rowan University so it can be catalogued and studied, as dinosaur material is scarce in the brooks. Why are there Cretaceous fossils here? During the Cretaceous, our continents were nearly in their present positions. However, the Earth was much warmer. This resulted in high sea levels. As a result, Europe was composed of numerous islands, while most of the North American coastal plain was submerged. States such as Georgia and Florida were completely submerged. 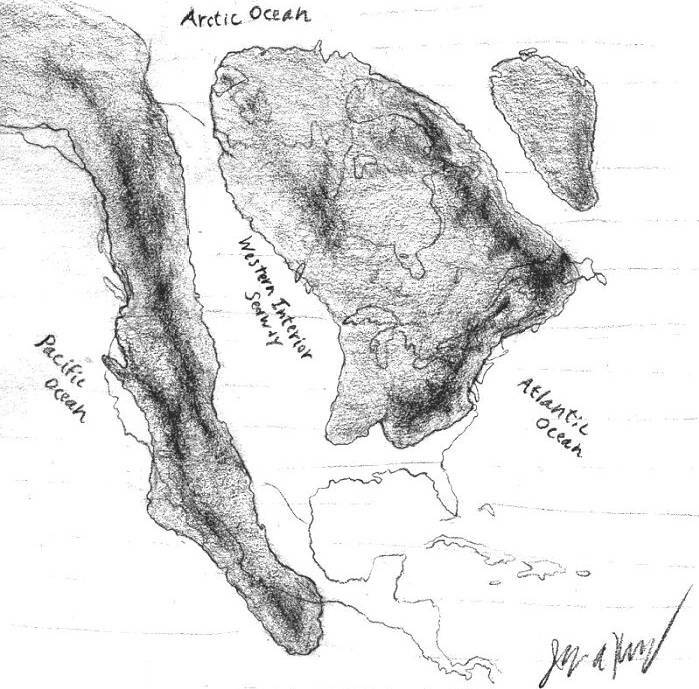 The high sea levels also caused North America to be split in two. A great interior seaway flowed through much of the great plain states, from Texas to North Dakota and through Northern Canada. This can be seen in the sketch below. New Jersey was also submerged. Remains of prehistoric animals accumulated on the sea floor that is now New Jersey. These remains were buried by the nutrient rich sediments coming from shore, and are now part of fossil bearing layers of the Monmouth Group. These Cretaceous marine fossil layers are exposed by brooks that cut down through sediments in the Big Brook area. Numerous fossils of sharks can be found as well as invertebrates such as mollusks and Belemnites. Also, the great reptiles that ruled the seas in the Cretaceous can occasionally be found. These creatures include Mosasaurs, Pleisiosaurs, and large Crocodiles. To learn about Mosasaurs, go to the Mosasaur Gallery. However, since this area of New Jersey was only miles from the coast, the remains of land animals occasionally washed out to sea. Although rare, fossils of land animals can be found. These fossil remains are often pieces of dinosaurs, such as Hadrosaur teeth and bone fragments. 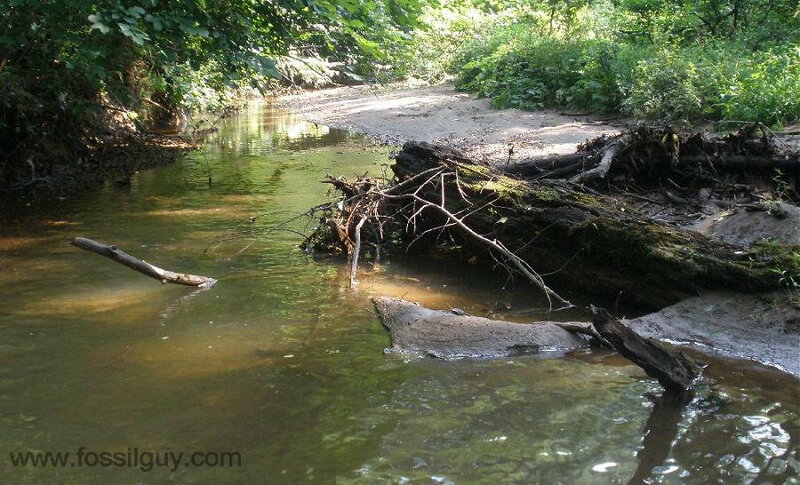 Fossils in the Big Brook area have been washed out of their sediments by the water action. These fossils can simply be found in Big Brook and surrounding brooks by screening gravel bars and walking the creek beds. The following book: When Dinosaurs Roamed New Jersey is a great book to learn about New Jersey Paleontology and the geologic history of New Jersey. It is very accurate, as the author is a scholar in the field of paleontology. There is even a section that describes fossil hunting sites in New Jersey. The Fossils can be found just past Freehold in New Jersey. Some locations are shown below. Please remember to adhere by the collecting regulations listed further down this page and do not tresspass on any private property. Stay in the creeks and DO NOT DIG. It's a small pulloff on the side of the road. It's near the Winery (Four JGs Winery). 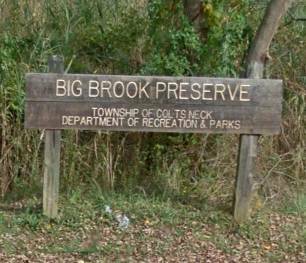 Once you park here, there is a small walk to Big Brook. Remember, when collecting fossils here, adhere to the regulations listed in the next section below. The popular access point on Boundary Road is closed, please use this nearby Hillsdale Road access instead. 3. Sifting screens can be a maximum size of 18"
4. The collection of fossils within the preserve is limited to those fossils found within the actual stream water line. Fossil extraction is prohibited from the walls of stream bed above the stream water line. 5. If you are in a group of 15 or more, you must obtain a permit first. Fossils erode from the banks and bottom of the Brooks and collect in gravel areas. The simplest way to fossil hunt is to slowely walk the creekbeds and carefully scan the gravel areas for the occasional fossil. The key is to SLOWELY walk. Take your time. To increase the fossil finds, both in quantity and quality, many people sift the gravel beds. A small shovel and sifter allows one to search through more gravel than simply scanning the ground for fossils. The information below shows when to go, and what and recommended regulation equipment to bring. It's best to fossil hunt in the brooks just after rains and in the early spring. The rains and the freeze/thaw cycles erode more fossils out of the banks and into the grabel areas. Fossil hunting during a rain storm is not recommended, as the brooks flood. Fossil hunting in mid-summer during a drought is more difficult, as fewer fossils will have eroded out. According to the township regulations, your trowel blade cannot be over 6", and your screen cannot be over 18" in size. I recommend the shovel and sifter shown below, they satify the regulations and are lightweight. • Waders or thick bottomed shoes - there is lots of broken glass in the stream beds. • Bug spray - there are lots of ticks and mosquitos in and around the streams! This is a 13.25-Inch diameter and 3.5-Inch deep sifter. It's lightweight and the 1/4" screen is ideal for shark tooth sifting at the brooks. It is also under regulation size so you won't get fined! There is also a 1/8" screen version for the really small stuff. This Screen: Bosmere N480 Sieve, 1/4-Inch Mesh is a bit more durable, as the 1/4" screen is powder coated.